One in three people will develop cancer in their lifetime and coping with this horrific disease can be all-consuming. 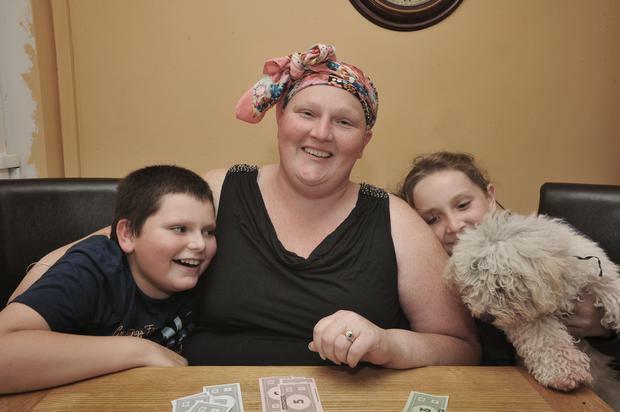 Not only is Carol Haslam facing a battle with cancer, she also has two children with special needs to care for. "My 11-year-old daughter Niamh has Asperger's and my 10-year-old son Daniel has autism which is further complicated by sight and hearing difficulties. "I am their carer and while they both have issues, Dan in particular [is vulnerable] as he is losing the sight in one eye, I have never had any problems looking after them and am so proud of them both in every way. "As well as being a mum, I worked for years as a florist, but last year I was diagnosed with a very rare form of cancer in my left hand. Between the chemotherapy and hospital appointments and now the awful news that I am going to have to have my hand amputated along with most of my lower arm, I have had to give up work - so I am now their full-time carer as it is unlikely I will be able to get a job again. "Needless to say, being told you are going to lose a limb is a shocking experience and one that I never thought I would have to face in my life, particularly as I am only 37. But on top of facing into an uncertain future, life is also very difficult on a practical level at the moment because even though I had three months of chemotherapy, the tumour didn't shrink and while I am waiting to have an amputation, my hand really hurts so I am not much use around the house. 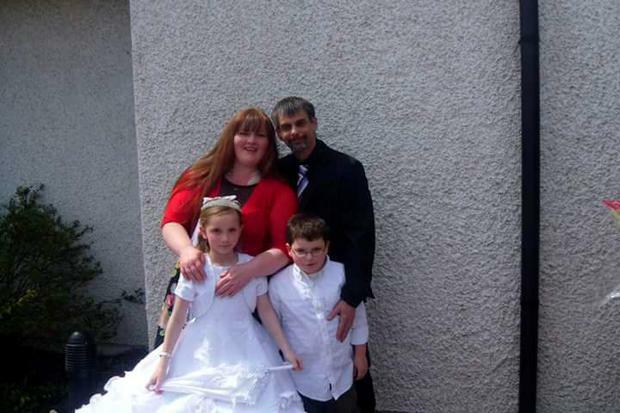 "Life was equally hard during treatment because although my husband Kevin is fantastic and really does so much for all of us, he also has to work so there were times when I was caring for the kids and feeling just dreadful - I had a bucket in the car and would often need to be sick while I was driving - it sort of felt like being pregnant as I was tired and sick all of the time, but when you have two children who are dependent on you, there is no choice but to function. "Both Niamh and Dan are aware that something is going on with me and I am trying so hard to keep the worst from them as if I crumple, then so will they. "I can't break down in front of them so I am doing my utmost to keep strong and positive when they are around. But I can sense that they are worried as there are certain things I can't do any more and won't be able to until I get a prosthetic arm. Niamh is very sensory around her hair and isn't great at brushing it, so this is something which is proving difficult for us right now. And while Daniel is fairly self-sufficient when it comes to getting dressed, he can't tie his shoes so I have had to source Velcro versions to make life easier for us all. Kev and I have always been an equal partnership but I used to do most of the cooking - that has now changed and I am less able to prepare food for the family which I find quite distressing. "I am also a self-confessed control freak and really hate having to be dependent on others for help. "Since the beginning, I have managed to look after the kids and work so since I became sick, I am finding it really difficult to ask for help. "I am, of course, really appreciative of all the support and I have a wonderful and very large family who have been amazing, but it goes against the grain for me to have to rely on others to do things for me. I am far from happy with my diagnosis and, deep down, I am devastated at the prospect of losing my hand and arm, but there is nothing I can do about it. "This is what is happening and I have to face up to it. The kids need me and I have to be positive for them, because if I lose it, so will they and it isn't fair on them. "Also, I can't afford to be an emotional wreck as they rely on me to be strong - when we were told that Dan was losing his sight, I cried for weeks - but getting so low caused me to become physically sick and I ended up in hospital with tonsillitis. "So I am aware that I have to be strong as they need me to be around for them - even if I am one-handed. At the moment, I am just taking each day as it comes, I can't second guess what things will be like when I actually lose my arm and I'm sure there will be days when I go to do something with my left hand and have a nervous breakdown when I realise that it's not there, but that I will deal with that when it happens. "Life throws all sorts of things at you and you can either fall or just get on with it. "There are a lot of people who are in situations worse than mine, so whatever the future brings I am going to try and be positive and make the best of the situation, for all our sakes."